(Norwell, MA) Evita is a strange rock operetta. It sounds a great deal like Jesus Christ Superstar and is narrated by a political figure that did more work in Mexico and Cuba than he ever did in Argentina. Additionally, Webber and Rice posit the musical against Eva Peron. She’s treated as a mere political trinket during a time when she symbolized the heart of the Peronist movement. 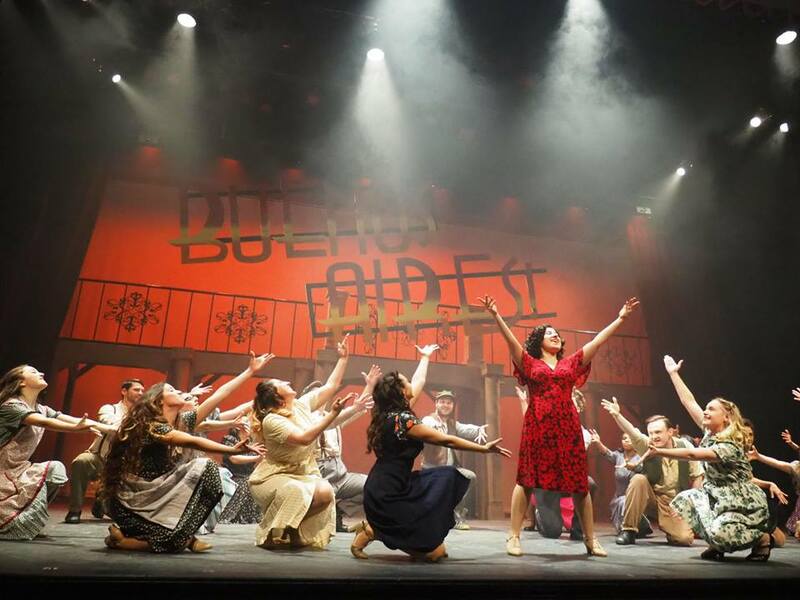 Evita is a problematic piece but the Company Theatre does a fine job producing it. Evita follows the rise of Eva Duarte (Kristen Huberdeau) from advantageous teenage club girl to Eva Peron, infamous wife of Juan Peron (Dan Kelly). Her course is stalked from the sidelines by a preternatural, Elf on the Shelf-like Che Guevara (Ken Bayliss). Eva’s emotional work uniting Argentina is disrespected by her husband’s political allies. She is simultaneously raised to saintly heights by the nation’s proletariat. Somewhere in all of this, Eva fights to find her true self before her death to cancer. Major kudos to the cast and crew for wrangling this opera! The music direction by Bethan Aiken pairs beautifully with the choreography of Sally Ashton Forrest. Healey conducts his orchestra with great sensitivity. Big numbers like “Buenos Aires” and “A New Argentina” incorporate all of the cast’s strengths and give the orchestra the chance to shine. More intimate moments such as “The Art of the Possible” and “Waltz for Eva and Che” highlight individual members talents. “Waltz” also tells us that Huberdeau’s dancing skills are underutilized but politicians’ wives don’t dance with the ensemble. Sydney Palmer delivers the most pure moment of the production. Her solo work in “Another Suitcase In Another Hall” offers sweet stillness in a production otherwise buzzing with contrivance. The projection design by Corey Cadigan was a pleasant surprise. It added depth to the production by giving us historical context. It’s movie reel styling recalls the beginning of the musical and foreshadows the end. All of this hard work was undercut by chatter from the zealously gossiping audience. The audience-right intermission social connection continued well into Act 2. It behooves the men and women in the audience to defer to the hardworking performers. If it takes interference from the ushers then so be it. The local scuttlebutt will still be fresh after the final bow. The Company Theatre is a community theatre located on MA’s south shore. It’s membership is representative of much of New England: white. The theatre can only cast the people who audition for a Webber/Rice musical. The purpose of such a production of Evita in such a location is to tell a story. Its telling will not necessarily reflect historical truths. Especially if that story is told by two English white men so steeped in their colonialism that they honestly think they’re of an authority to tell the story of an Argentinian heroin. Eva Peron was Spanish-French. Peron was Spanish. Guevara was Spanish-Irish. The 2010 Argentinian census tells that the majority of Argentina is white. History tells us that power sways white but that doesn’t excuse contemporary white-washed casting. All theatre companies should incorporate more people of color in all leadership positions. More people of color should be cast in every production because that is the right thing to do. Evita is racist but not because the Company Theatre made it that way. This entry was posted in Uncategorized and tagged Andrew Lloyd Webber, Argentina, Bethany Aikin, Che Guevara, Corey Cadigan, Dan Kelly, Eva Peron, Evita, Jordie Saucerman, Ken Bayliss, Kitty Drexel, Kristen Huberdeau, MA, March, Norwell, Paula Peasley-Ninestein, Sally Ashton Forrest, The Company Theatre, Tim Rice, Zoe Bradford by Kitty Drexel. Bookmark the permalink.